Hello my friends! I hope you all had a fabulous weekend and did something nice for yourselves… you deserve it! Shades of grey are a HUGE colour trend. Don’t believe me? Go check out some popular boards on Pinterest! You’ll see beautiful designer grey rooms paired with popping jewel tones and soft yellows and pinks. 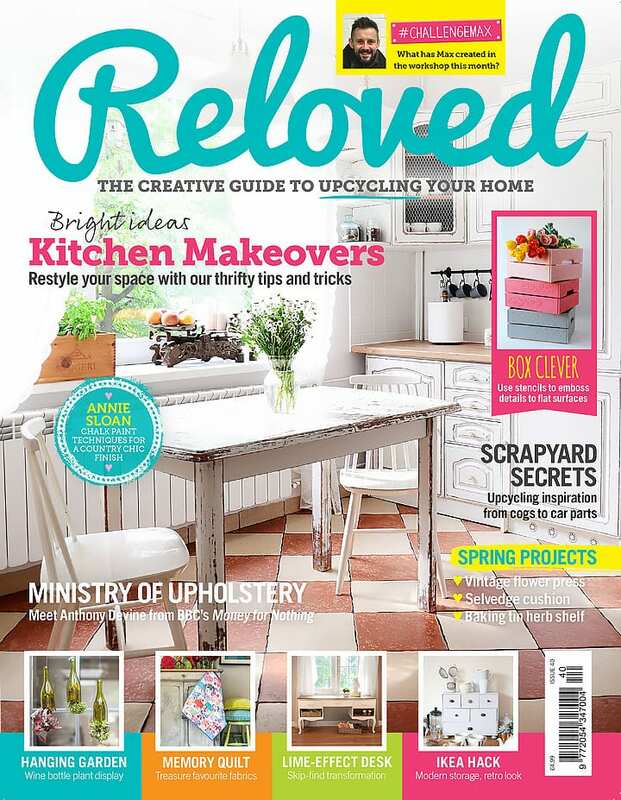 Furniture make-overs and décor go hand in hand. Gorgeous grey washed furniture displayed as focal points in a room is fab! I just finished up-cycling a 70’s side table and want to show you how I Grey Wash Furniture with Wax. It’s very simple to do and the end result …well I’ll let you be the judge…. 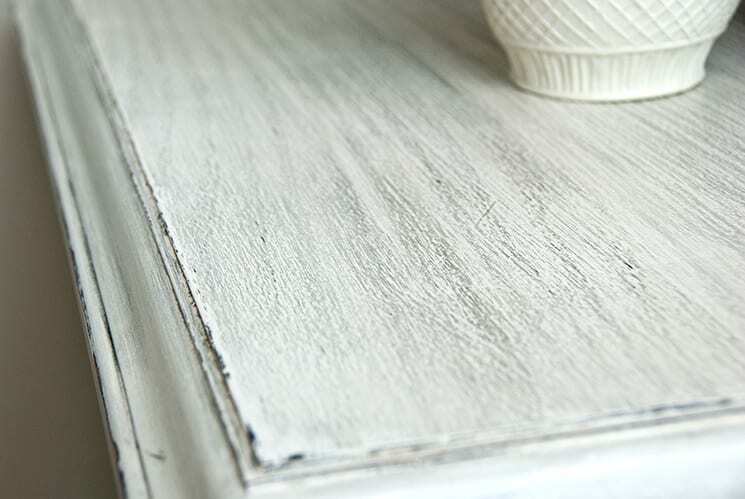 DIY Grey Wash originated from white washing wood which has been around for centuries. The wash effect brightens up furniture and adds interesting depth and dimension. This wash technique using DIY Tinted Wax is best suited on painted furniture. I find the VERY best results comes from using chalk paint, a brush, and a textured piece of furniture. 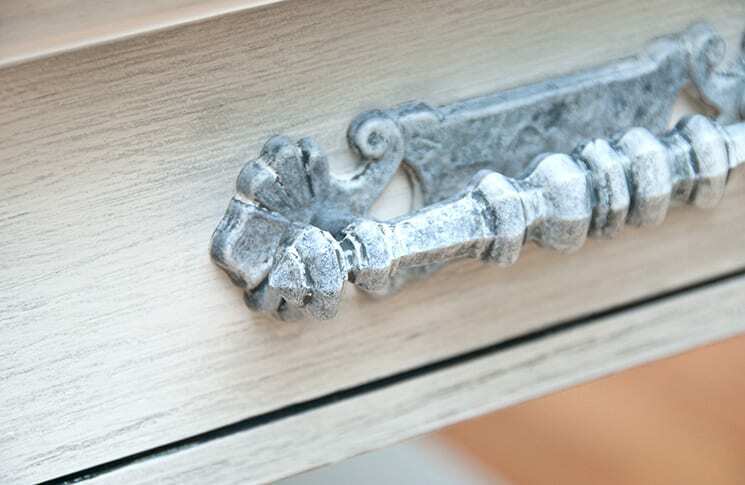 The brushed on chalk paint and grain textured furniture leaves a porous surface for the tinted wax to grab onto. 1. Prepare your furniture for whatever method you are using for it’s base coat. As mentioned above, a brushed on finish is ideal for this grey wash waxing technique. Cleaning, sanding, priming and painting may be required for a regular latex paint. I painted this dark outdated 70’s side table using a HMCP Recipe in white. Because I used chalk paint, I gave the table a thorough cleaning but NO sanding was required. 2. After you finish painting, apply a CLEAR coat of wax. I used an old rag to apply Minwax Paste but whatever wax/application you enjoy using will work. This first coat of clear wax IS necessary. It will be the base wax which helps control and remove the amount of dark wax you will be applying on top of it. 3. Here comes the fun part. 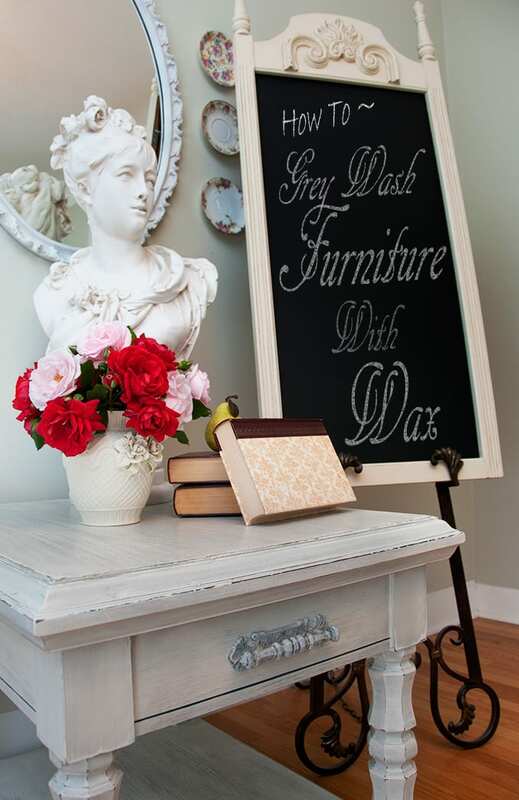 Mix some black or dark grey paint into your wax to create a DIY Tinted Furniture Wax. 4. Apply the diy dark wax with a rag and wipe off excess. Work in small sections to get the desired wash effect. 5. If you see the wax is applied too heavily in some areas or you would like to lighten it up, use a 3rd coat of clear wax to reduce the intensity of the dark wax. 6. Sand and buff to desired sheen. I used my DeWalt sander with a 220 grit paper to speed up the process but hand sanding works just as well. The more you buff the wax, the glossier your finish will be. I love hearing from you! If you have any waxing questions or tips, feel free to leave a comment. I love this and would like to have the same look on a piece of furniture I bought. My piece is from the 70s and looks light yellow, my question is will this method work for me since the wood is not dark enough to see the grain coming through the white paint? I just found your tutorials while I was trying to figure out how to make my own custom dark wax and I love them, thank you! Would you suggest also thinning a little with mineral spirits for this method? I’m so excited to make a grey wax rather than the usual brown antique wax! Thinning with Mineral Spirits can really help harder waxes become more creamy. 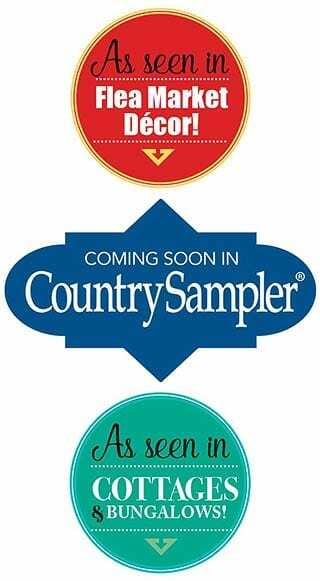 I like thinning when I use Minwax for example, but don’t bother when I use Annie Sloan, Dixie Belle or other ’boutique’ waxes. Will this work in the reverse? Dark paint then wax and then add white paint to the wax? I’m a little confused. Why do you sand after you wax? Wouldn’t that clog up your sandpaper? Hi Genevieve! Some people prefer to sand AFTER a coat of wax is applied simply to cut down on dust. In the case of this grey washed table, I wasn’t concerned about the dust, but I did want the dark wax to show of the wood grain. Sanding it to remove the dark wax from all areas (other than the grain) was a faster method. I have a bedroom set that I am thinking to tackle it and make it a grey wash finish- you probably answered this already but my question is how to I get it to be more grey with darker strokes? A darker wash can be achieved by using a darker tinted wax and/or applying it more aggressively Maria. Hi! I just got an unfinished parawood dining table. I plan to paint the legs and apron white. I would like the top to look coastal/cottage – mostly white but with some gray in it just to give the table a slightly different look. Am I better of using this method or painting the top grey and then white washing it? Hi Sherri! Whatever method you use ie wax or wash is a personal preference. However, if I wanted my table to look “mostly white but with some gray in it”, I would opt to paint it white and use a gray wash (or wax) over top. If you were to paint gray and then white wash, your prominent color will be the gray. Thanks for the reply. 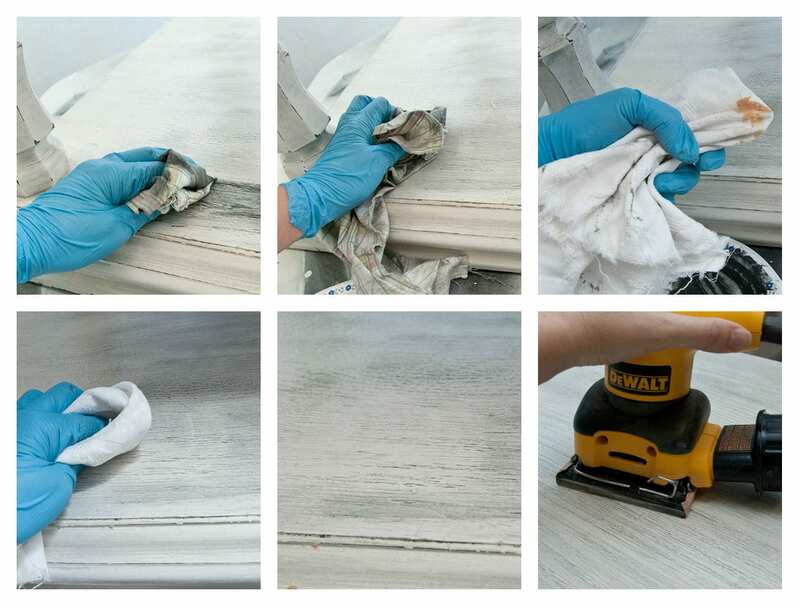 So if I wanted to use a wash so that I can seal over top of it since it is my kitchen table, would I just water down some gray paint like you do for whitewashing and then paint on and wipe off? Yes, you apply the wash (watered down paint) until you get the effect you desire. Let dry. Then topcoat. I have tried to white wash using a few different techniques (dry brushing was hardest and a big failure). What is your technique for white washing? I love the beachy look but have never been able to get it just right. Hi Renee from California! My sister and I visited your state about a 1 1/2 ago and LOVED it! 🙂 Here’s my technique for whitewashing furniture. 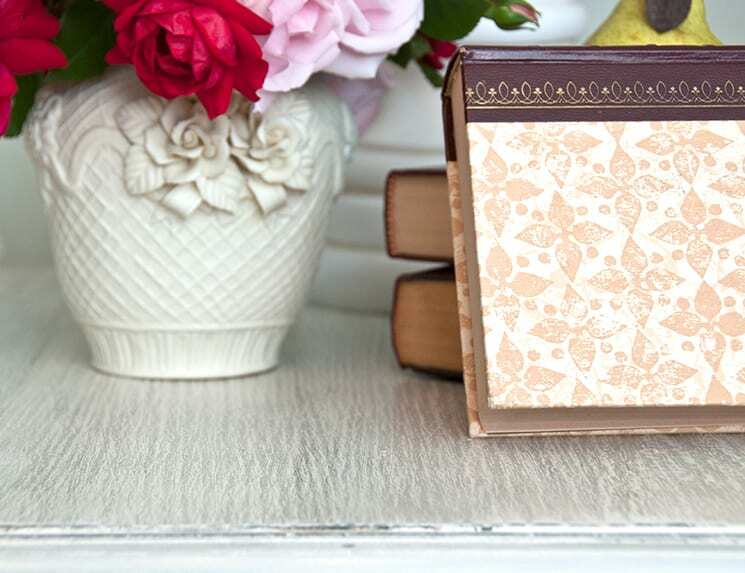 Do you think you could get the same effect with white latex paint and a gray glaze? I have an artist friend who mixes a little tube of oil paint with mineral spirits to create her own glaze. So easy and she has produced some stunning antique effects CHEAP! I got my supplies at Hobby Lobby for less than $10 and tried it on a console table. I haven’t tried a light oil paint but seems like it would work. what do you think? I want to do this with an unfinished table for the kitchen. Do you sand between your layers of chalk paint? Once I put on the wax, since this is a kitchen table, should I then seal it with something so that I can wash it down? Hi Sherri! 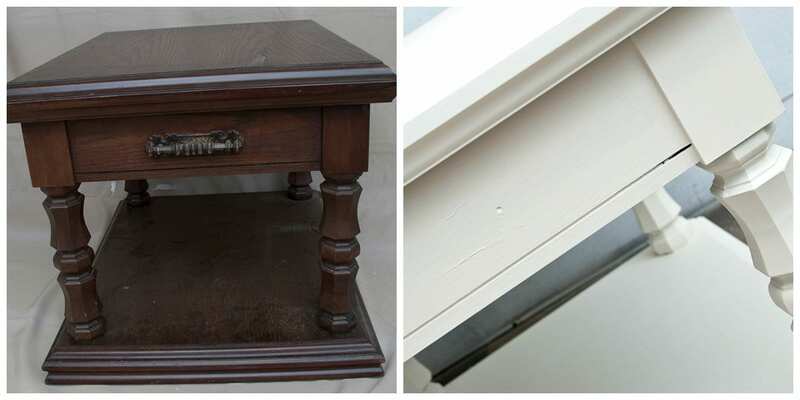 Yes, you can give a light sanding between each layer of chalk paint – this will give a really nice professional finish. If you topcoat with wax, you can not apply anything else over top because it will not adhere. What type of black or grey paint do you use to mix with the wax ? How long do you wait between coats of wax? Denise, love this piece! What technique did you use on the handle for the drawer? Hi Melissa! For the hardware I gave it a little sanding and then applied DIY Chalk Paint – then wiped off the excess. Repeat until you get the desired effect. Hi Denise, I am midway through this project on my dark wooden dressers. We are using latex paint and have already applied 2 coats and the wood is bleeding through a bit. (Each coat takes 5 hours to apply!!) Is it important to get the paint evenly covered, or will be be masked by the grey tinted wax. Thoughts? Thanks! Melissa, it’s a challenge to say because I don’t know the extent of the bleed through or how dark your grey wax will be to cover your desk. Ideally, the paint should be evenly covered. If there are just a few spots coming through, you could try spot treating with shellac and then paint another coat or two. 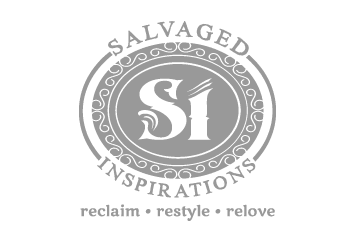 Otherwise, if you’re using a very dark grey wax and the piece will be heavily distressed, the few spots may fade into the finish and not be noticed at all. What tool did you use to buff the piece? If buffing the same thing as sanding? I used a clean soft rag to buff the piece MG. Sanding is not the same as buffing. Buffing is when you wax on and wax off and then lightly rub or polish the surface until you get a nice sheen. The more you rub and polish – the more shine you get. Thanks for the response! One more question…I plan to do this exact grey wash based off of your blog. Did the Minwax leave the piece looking yellow or tinted of yellow? No MG, once the Minwax is dark tinted, it will not. I have searched so many sites and i love how this turned out! However, can i achieve the same look without using chalk paint??? Thanks so much for sharing!!! Love this!!! What did you do to the hardware on this piece? Thanks Theresa! All I did with the hardware was clean, scuff, and dry brush with chalk paint. Then I sealed with a satin wipe-on poly. Thank you Krista! And no, you do not need to apply wax as a top coat regardless of what method of painting you use. To get a similar “waxed” look, you can try a satin or flat poly. They work very nicely. Finally, lots of time saving,useful tips! Thank You! My biggest struggle is knowing how to price the pieces. Other than researching on line prices (items are never exactly the same) any thoughts? How long do I have to wait for my HMCP to dry? This is my first attempt and I love it so far! I am itching to start waxing …. I love your enthusiasm Lisa! Usually not very long… once the chalk component is added, the first coat usually dries with 40-60 minutes. I haven’t seen this technique before. I love it!!! Gray is my favorite hue and it’s fun to see it used in this way. Thanks for sharing! I love your blog, and your step by steps!! Great visuals and end results are stunning!! Hope my projects turn out as lovely as what you’ve offered up on here!! I love your work…Which HMCP Recipe did you use.. Thank you Amanda! 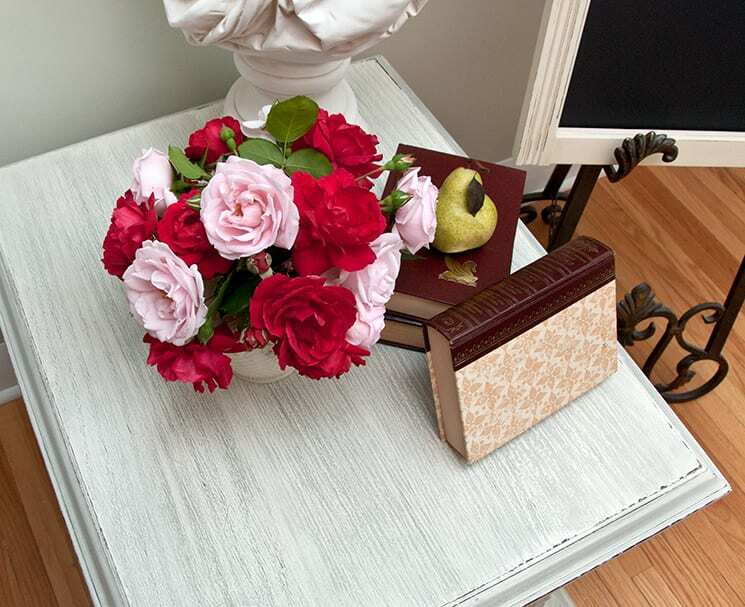 For this grey washed side table I used the Plaster of Paris recipe. iful chalk board, if so, how it the world did you learn how to write that pretty? I would love to be able to do that, any tips on that? You have another fan. Have a great day! Love your comment! I can take full credit for the beautiful chalkboard (thank you very much Kathy!) 😉 but unfortunately I have to give the credit to Photoshop for the pretty writing. I know of some bloggers who pull font off the internet and then stencil the beautiful print onto their boards. Diane @ In My Own Style has a tutorial on this which you can check out here ~ http://inmyownstyle.com/2012/07/how-to-draw-like-an-artist-on-a-chalkboard.html. Thanks for taking the time to comment…I’m glad my PS skills are improving and I made it “look” like I chalked it on!! I just found you on Pinterest, usually I don’t take time to comment. I Love EVERYTHING I have looked at!! A new fan! !